Paavo Järvi: Cincinnati Symphony Orchestra. Debussy, "Prelude a l'apres-midi d'un faune," Nocturnes, "La Mer," "Berceuse Heroique." Telarc. 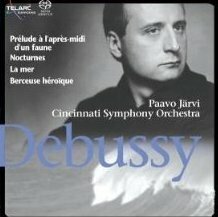 CSO music director Paavo Järvi gazes sideways over a crashing wave on the cover of his latest CD with the CSO, an all-Debussy compilation including "La Mer" and two more of the composer's best known works, "Prelude to the Afternoon of a Faun" and "Nocturnes." But look, there's a stowaway here, Debussy's little known "Berceuse Heroique," a 1914 work, originally for piano, orchestrated by the composer in 1915. It's an elegant touch, a bit of "spice" as Järvi would say. Thoughtful, too, for it was inspired not by ocean spray, clouds sweeping across the sky or pure aesthetics, but by world events, in this case the fall of Belgium in World War I. As such, it makes a subtle statement at the close of this opulent disc. Järvi's "Faun" is about as impressionistic as they get, beginning with principal flutist Randolph Bowman's softly sensual introduction, harpist Gillian Benet Sella's tingling glissandos and the French horns' questioning motifs. It builds to a carefully calibrated climax before receding whence it came. The three "Nocturnes" are brilliant. "Nuages" ("Clouds") paints a haze of gray, punctuated by English horn and glints of sunlight in flute and harp. "Fetes" ("Festivals") conjures a noonday vision with its brassy, clamorous, ghostlike parade. And "Sirenes" ("Sirens") sounds more alarming than usual, with the women of the May Festival Chorus as flesh-and-blood embodiments of the mythological temptresses-on-the-rocks. "La Mer" is affectionately performed, perhaps not surprising by a band located 14 hours from the ocean. The sea foam really does dance here, the waves rumble and the wind blows and it is sonic beauty that leaps off every page of the vibrant score (the Telarc engineers are magicians). The concluding "Berceuse" is moving in the extreme, an elegy whose steady, quarter-note motion at the beginning recalls Stravinsky's "Firebird." It's a dark piece broken by trumpet calls as from a distant battlefield and echoes of the Belgian national anthem. Järvi is working with a highly responsive instrument in the CSO and you can hear it on this superlative disc. If you want beautiful music beautifully played -- and who doesn't -- get this one, available in record stores today.